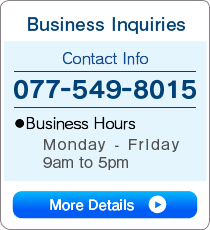 Upon reviewing your inquiry, we'll contact you by email or telephone. After hearing and considering your specific needs or conditions for installation, we will get back to you with an optimized plan. Please fill out the required fields and click 'Confirm' to proceed. Please fill out the required fields on the form above before sending. ※We will get back to you via email or telephone as soon as possible, but responses may be delayed for inquiries sent outside of our business hours.